This practical and interactive course has been designed to give participants, whether an HR Advisor or an experienced senior manager, the confidence to conduct effective investigations in a fair, professional and timely manner, aligned with policies, procedures and best practice. The session will explore in detail the logistics of the investigation process which includes asking difficult questions and analysis of evidence provided. Serious complaints and grievance cases of bullying or harassment require a full and formal investigation which must be both prompt and professional. Inappropriate handling of such complaints can lead to lengthy, costly disputes and possible tribunals. Those who are tasked with investigating such cases need to be confident in their role and equipped with both the expertise and the essential soft skills to ensure they can resolve cases fairly and consistently. This interactive course will be adapted to meet the needs of the participants and will include discussion and sharing of best practice. Due to the expertise and experience of the facilitator, queries will be responded to in a sensitive and understanding manner. The training style and method will model the concept of respect and dignity. The course is suitable for any member of an HR or management team who has responsibility for interviewing the parties involved in a serious complaint or grievance investigation. 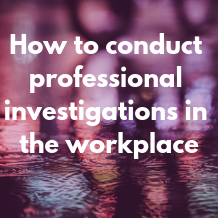 The course will focus on both the practical aspects of conducting the investigation as well as the ensuing evaluation once the investigation has taken place. The delivery will consist of a combination of formal lecture, small and large group discussions, case studies and pre-course reading.